I’m officially 10 days into my Whole 30 program. For those of you who have been following me on any form of social media, I apologize for all the snaps, tweets, and posts about food, but it’s been like an extra little accountability check for me. So if I go missing on social media, you’ll know I’ve fallen off the sugar deep end! Something I learned about this process in the first ten days is that it really is only as hard as you make it. If you plan poorly and surround yourself with temptations 24/7, you’re more likely to fail. Instead, do you research, prepare as much as possible, surround yourself with a positive environment and support system and you have all the tools you need to be successful! 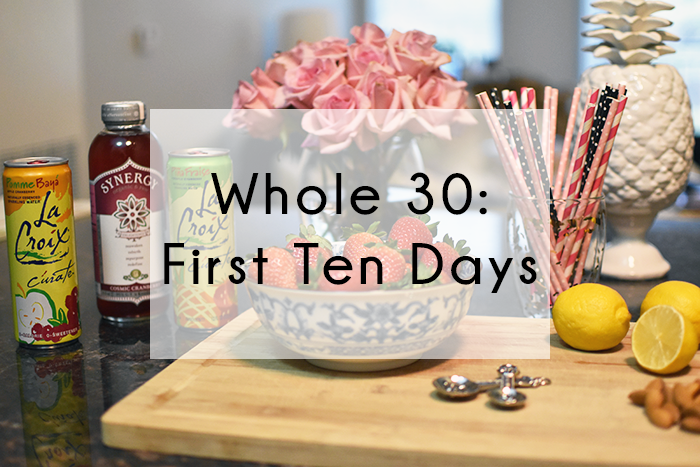 One of my bigger concerns before I started was that I would go completely into withdrawal and feel totally miserable, so I thought I would take a little time to summarize and walk you through how Whole 30 was for me in the first ten days. For the most part, what I felt was pretty true to what the book tells you that you will be feeling, but I didn’t have drastic changes in how I was feeling day to day. I did start sleeping better after day five, which was one of my main goals in the Whole 30 challenge. I won’t say I was bright eyed and bushy tailed when I woke up. Mainly because I never am first thing in the morning, but I actually enjoyed the black coffee and Larabar I had pre-workout. For the rest of the day, everything went pretty normally until about 3:00. I totally crashed. I know they warn you not to workout in the first couple of days, but right now, working out is one of my top priorities and if I break my routine, it’s that much harder for me to get back into it. I never nap during the week, but I was so tired I had to sleep for about an hour. So the food hangover they talk about in the book is real. I woke up with a headache, and although it wasn’t terrible, it was definitely there. It was also really hard for me to eat breakfast this day. All I wanted was my coffee with creamer. My mood didn’t really improve throughout the day and I would categorize this day as hangry and moody, which was definitely due to the lack of sugar. I had an event that evening that included a barre class and I was so nervous I would be starving after working out and reach for anything and everything they had for us to eat after. To try and keep myself from being tempted I ate a pretty hefty lunch and made a big pot of chili earlier in the day and knowing I had that at home made it that much easier to resist the wine and cheese they had for all of us. Yes, I avoided wine and cheese! It was hard, but not impossible. They did have sparkling water and grapes that I could eat which helped me feel better while everyone else was eating. I woke up and took a spin class and felt on top of the world after so I decided to run a few errands. If you follow me on Instagram, I had a serious conversation with a few people about bacon. I actually think I told just about anyone who would listen that I had finally found Whole 30 approved bacon! I did eat some of that bacon for lunch, but when it came to dinner I started to feel so indifferent to everything. Nothing sounded appetizing. Not even food that is off plan. We ended up at Chipotle where I got the approved carnitas, guac, pico and lettuce. I woke up feeling good enough to show up to my spin class 45 minutes early – totally not on purpose. I’m blaming these little mix-ups on something I like to call Whole 30 brain. I was pretty hungry by the time I got home and made an egg scramble loaded with veggies and some of the bacon I had found the day before. I started to do some chores around the apartment and a wave of exhaustion hit me. I took a quick shower and hopped in bed and slept for about an hour. I’m guessing it was all the spin/barre classes in combination with change of diet that had finally caught up to me. These days were a little difficult because we planned on running errands and going to a movie. I had new meals planned for breakfast and dinner and leftovers for lunch, but we ended up not being home for lunch. Talk about poor planning on my part. While we were out, we ended getting pretty hungry, so we went to a local place that serves organic and grass-fed products and I got a bun-less burger loaded with veggies. Definitely the first time I’ve ever eaten a burger out of a bowl! Going to the movies was really hard too because like I mentioned in my date night post, we love popcorn and Icees. It was sad that the only thing the concession stand offered that I could have was water. I thought about sneaking in a tea from Starbucks, but Kyle told me he would judge me so that was a total fail. Overall my energy levels were good the entire day and the only thing that bothered me was some sugar cravings throughout the day. Other than day two, this was my hardest day. I don’t think that’s very typical of Whole 30, but it was for me because I had an event I had to be at all day and was constantly surrounded by temptations. It took every ounce of willpower not to chomp into some of the sandwiches (and cookies!) they had for lunch. And to make things worse, there were bowls of peanut M&Ms out all day. For some reason, those are just irresistible. I guess the short story of this day was that the temptations were still there for me, but at this point I knew not even a bite, or peanut M&M, was worth ruining all the hard work I had put in so far. This day was a busy day for me, but there wasn’t anything drastically abnormal. I really felt like I was starting to get the hang of things and I was starting to enjoy cooking. I may or may not have gotten so excited that I made a few pounds of cauliflower rice to freeze, breakfast for most of the week and prepped a few other meals! What was the hardest/what did I miss the most? Weekend brunches, lattes, sweets and half & half in my coffee. Without a doubt the hardest thing for me was not being able to sit and enjoy a slow weekend morning with lattes and our weekly cheat meals. Lunches were also really hard for me. I usually don’t like to stop and sit down for a meal, so it was a big change. One thing I know I need to work on is making my dinners more leftover friendly so I can just grab something to heat up instead of cooking a full meal for lunch and then turning around and cooking dinner as well. Snacks: Larabars (Cashew Cookie is my favorite), unsweetened black tea from Starbucks, La Croix and clementines. This process is a little different for everyone, but if there are any specific questions you have for me, feel free to ask! I’m so glad the first ten days are behind me and I’m really looking forward to seeing how much better I can feel in the next 20 days. I’m planning on sharing some recipes and meal prep tips after I test some out in the next phase of the program. I’ll also be doing another update soon, so let me know if theres anything else you’d like me to include!